SAN FRANCISCO, March 19, 2015 /3BL Media/ – Sustainable Brands® recently announced the expansion of the Activation Hub at SB’15 San Diego, June 1-4, 2015 at Paradise Point Resort & Spa. As a central networking hub, this action-centered environment will serve as an ideation marketplace for global brands looking for specific solutions to scale sustainability initiatives. Hosted by BASF, the Activation Hub is designed to cultivate conversation and debate around a series of topics that mirror topmost initiatives in the full conference program. ‘How Lounge’ areas devoted to Smarter Homes and Cities, Optimal Supply Chains, the Circular Economy, Driving Demand & Behavior, Macro Trends & Drivers, and Workplaces of the Future will feature operational management tools, nature-based product and packaging solutions, LCA tools, waste-to-resource solutions and more. Knowledgeable experts from organizations such as CVS Health, MBDC, JetBlue, IPG Mediabrands, Environmental Defense Fund (EDF), thinkstep, MSLGROUP, Canon, Waste Management, The Nature Conservancy, UL Information & Insights, iCompli, Dix & Eaton, Sealed Air Corporation and others will participate by showcasing their innovations and ideas. Edelman hosts the ‘Driving Demand & Behavior’ How Lounge: Dubbed the Story Lab, Edelman will guide brands and attendees in ‘hacking’ their sustainability experiences to create meaningful and compelling narratives. Target hosts the ‘Social Enterprise’ How Lounge and sponsors the SB Innovation Open: Eleven semi-finalist social and environmental entrepreneurs will pitch their business plans to an esteemed panel of judges on Tuesday, June 2nd. Four finalists will be chosen to present on Wednesday, June 3rd. Collaborative breakout sessions focused on supply chain and procurement initiatives will spill from the conference and into the Activation Hub on a daily basis. Attendees will hear case studies directly from Sprint, Starbucks, Kimberly-Clark, LEGO, Timberland and others. A dedicated area for organizations and nonprofits, the Causeway will be an opportunity for participants and attendees to engage with impactful and net positive causes. Acting as ‘Master of Ceremonies,’ Derek Young – a CSR, sustainability and communications executive for over 17 years – will lead participants, speakers and attendees in various co-create and brainstorming sessions designed to spur debate and build long-lasting partnerships. 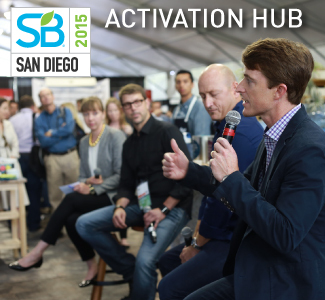 The Activation Hub at SB’15 San Diego runs Monday, June 1st through Thursday, June 4th. Sponsorship opportunities are still available for companies who wish to demonstrate their product or service as a trusted business solution. Contact Jonathan Reese, jreese@sustainablebrands.com or Emily Taken-Vertz, emily@sustainablebrands.com for more information about custom sponsorship packages, which include participation in the Activation Hub. Phone inquiries, please call 415.626.2212. Further information, including an initial list of speakers and sponsors, a downloadable brochure and conference schedule for the June 1-4 event at Paradise Point Resort & Spa in San Diego, CA, can be found at www.SB15sd.com. Registration is now open. ​Sustainable Brands® is the premier global community of brand innovators who are shaping the future of commerce worldwide. Since 2006, our mission has been to inspire, engage and equip today’s business and brand leaders to prosper for the near and long term by leading the way to a better future. Digitally published news articles and issues-focused conversation topics, internationally known conferences and regional events, a robust e-learning library and peer-to-peer membership groups all facilitate community learning and engagement throughout the year. Sustainable Brands is a division of Sustainable Life Media, headquartered in San Francisco, CA.